FiG has successfully helped to name the company and develop all of the company's new branding & marketing collateral, including their logo and all new website. 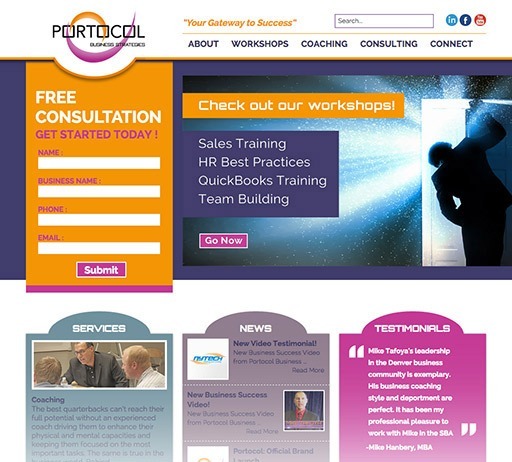 Portocol Business Strategies aims to be the number one business coaching, training, and consulting firm in Denver. Coaching is generally offered to business owners, senior managers, and supervisors to change and improve behaviors and mental processes for overall improvement of the individual within the business. Training is targeted to CEOs, managers, and department heads as a way to improve capabilities and knowledge and awareness of the business environment. Consulting is offered to owners and managers as a way to establish processes and design new systems to create a sustainable business model that a small business rarely has the bandwidth and/or the experience to establish on their own. These services also include strategic planning and resource development. Workshops and Seminars are provided as a marketing avenue but higher-value events are sold as an additional revenue source. These are fixed length classes providing a group learning environment on core business strategies and mental improvement. A client can take advantage of any combination of these services so long as they are committed to following through and long term engagement.